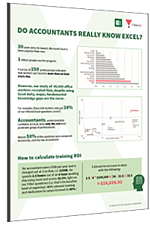 Infographic - Do accountants really know Excel? Our own research, conducted earlier this year, of 45,000 professionals (including 12,000 accountants) is the largest and most in-depth study of its kind, and strikes the right balance between high-level insights and useful, detailed training recommendations. From this research we've created this handy infographic comparing the Excel knowledge and proficiency of accountants against other professions and their peers.